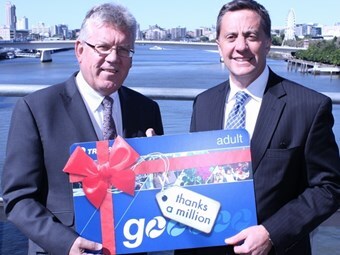 The smart card system designed and delivered by Cubic Transportation Systems Australia for Queensland’s public transport system has reached a major milestone with the sale of the three-millionth Go Card. Cubic Transportation Systems (Australasia) Managing Director Tom Walker congratulated both the system operator TransLink and the Queensland Government on the rapid growth in the number of commuters using the card since it was introduced four years ago. "Four years and three million cards – that’s a tremendous result for any system," Walker says. "The uptake of the card has been quite phenomenal since the Go Card system was fully deployed across TransLink buses, ferries and rail in mid-2008." Walker says it took two years to reach one million cards, then in mid-2011 it reached two million and today the figure stands at three million. Walker says TransLink continues to develop innovative ways to attract more people to use public transport, which would ensure that the number of Go Cards in circulation continued to grow. "A recent initiative was the introduction of free travel for customers after they complete more than nine journeys in a Monday to Sunday week," Walker says. "The program, which was the initiative of the state’s new Transport Minister Scott Emerson, has seen a jump in the number of commuters using public transport, as they take advantage of the free travel available." TransLink Deputy Director-General Neil Scales says Go Card now accounted for more than 80 per cent of travel on the south east Queensland (SEQ) public transport network each day. "The recent sale of the three-millionth Go Card is the latest in a series of milestones that indicate the maturing of our smart card system," Scales says. "We are using Australia's best public smart card technology and our customers are the big winners." Scales says the outstanding growth in Go Card use had helped to grow and improve the SEQ network. The Go Card system in Queensland is big, even by international standards, covering an area of about 10,000 square kilometres. It includes the state capital of Brisbane, and stretches north to Gympie and south to the state border with New South Wales. The Go Card system has been named as the best smart card ticketing system in Australia by one of Australia’s peak industry bodies, the Tourism & Transport Forum (TTF).